Surely that’s the only image that is conjured up when you clap your eyes on this, right? 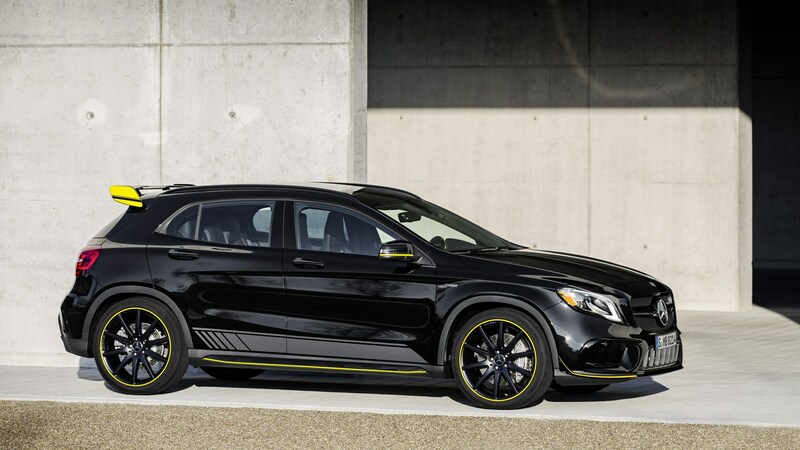 This is the Mercedes-AMG GLA45 Yellow Night Edition – a special edition version of Merc’s GLA ballistic baby crossover that was lightly updated in 2017. The whole range gained a slightly sleeker face and a couple of engine line-up tweaks, with the AMG version’s 2.0-litre firecracker benefitting from a power boost up from 355bhp to 376bhp. Gah! My eyes! 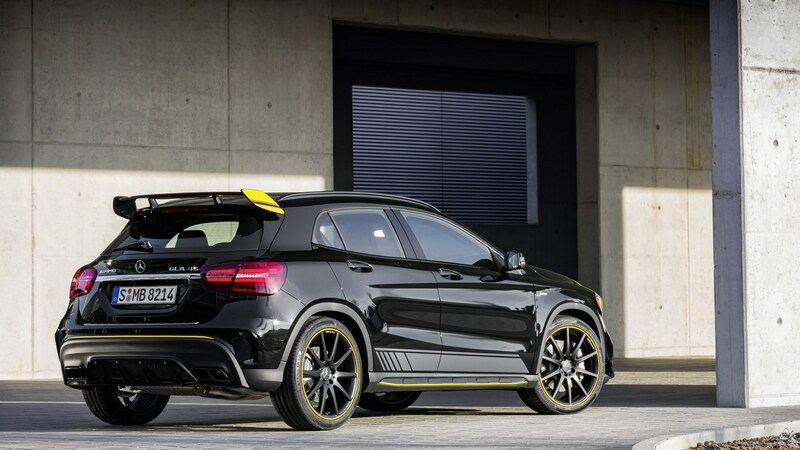 What on earth have they done to the Mercedes GLA 45? Yes it’s, um… challenging to look at. We’re inclined to avoid the ‘love it or hate it’ phrase, but when the car actually almost looks like a jar of yeast extract from a distance, it’s hard to resist. Basically, the Yellow Night edition you see here includes yellow trim on the 20-inch black alloys, yellow detailing on the front splitter, rear bumper and standard spoiler plus some dark grey vinyl decals. Inside, the GLA45's dashboard and inserts are finished in Alcantara, and more yellow detailing can be found on the standard (and very supportive) Recaro sports seats, steering wheel and air vents. After testing it over a few days, we experienced facial expressions from Joe Public ranging from subtle appreciation to dumbfounded shock - and even a few cringes out on the road. Without any provocation from us, one cyclist sped by cussing about how much he hated the way it looked. If you’re not a fan, you can avoid all of this and buy a regular GLA45, which just so happens to be about £7k cheaper. And it doesn’t always feel worth it, unfortunately. In fact, our test car totalled a smidge under £60,000 due to extra safety kit, the AMG Dynamic Plus pack (which adds a front axle diff lock and controllable sports suspension), parpy AMG performance exhaust and the AMG Driver’s Package that ups to the top speed from 155 to 168mph. The star of the show is the fusion reactor under the bonnet; the GLA45 (and its A45 stablemate) has the most powerful four-cylinder engine ever put into a production car. That engine is coupled to a seven-speed dual-clutch auto and 4Matic all-wheel drive, making it good for a 0-62mph sprint in a dizzying 4.4 seconds. It’s absurdly quick, but the engine lacks a bit of personality. Power is sent to the wheels progressively right up to the redline and the optional sports exhaust throws in some welcome belches when swapping cogs, but the four-pot has quite a dull drone compared to a Ford Focus RS, for example, and weirdly doesn’t feel as fast as the 0-62mph time claims. Grip is plentiful in the dry thanks to the 4Matic drive system so it’s quite hard to catch the GLA45 out, but the steering is a little too light to inspire total confidence and the ride in its sport setting requires real dedication (and a spine made from adamantium) to withstand its firmness. In the wet, grip is still in surplus but the traction control systems focus more on understeer in their slightly laxer setting. When you’re not driving around like your hair is on fire, the dual-clutch box suffers somewhat. When you initially press the throttle when moving off in traffic, the DCT sometimes struggles to find first as quickly as you’d like it and when you do, it lurches. The auto mode is great for pootling around, smoothly changing gears when you’re actually moving, though – it’s just that initial set-off. Is the Mercedes-AMG GLA45 Yellow Night Edition's interior all swish? Nope. Hopefully this will be rectified when the next A-class and GLA go on sale in a couple of years’ time, but currently the dashboard layout and quality feel years behind any other Merc currently on sale. We’d even go as far to say that material quality in some places is bettered by the GLA’s brother-from-another-mother, the Infiniti QX30. The centre console in particular uses very harsh and tinny plastics, while the button-heavy dashboard could easily be replaced or removed altogether as the navigation dial mounted on the centre console does most of the heavy lifting in terms of infotainment navigation. Storage-wise, the door bins are deep enough and the armrest-covered box at the end of the centre console will be fine enough for odds and ends. However, the cupholders are on the small side and the little cubby in front of the gearlever is only really useful for spare change. It’s a crossover, so can I fit people and things? Kids? Absolutely. Adults? That’s pushing it. If you’re a tall driver, the rear passenger behind you will be greeted by a slab-sided sports seat and will have to sit ‘side saddle’ in order to get any decent leg room. The rear windows are also quite small, so you might get a little claustrophobic back there. Still, there’s a generous loading area. In fact, the GLA’s 481-litre boot is larger than an Audi Q2's or BMW X1's but smaller than a Range Rover Evoque's. You can’t really step much higher up the hot hatch ladder than this absolute weapon of a thing, but it’s also quite compromised. That massive £53k price tag seems too greedy, considering its flaws. The interior isn’t as well made and the engine lacks character compared to an Audi RS3, it doesn’t offer as much driving poise or fun as even a Mountune-fettled FP375 Ford Focus RS and its impracticality for family life compared to rivals betrays its family crossover pretensions. If you’re dead set on a Merc hot hatch, the A45 is £13k cheaper than this and offers equally ballistic performance. A hatchback with more power than an old-school supercar.